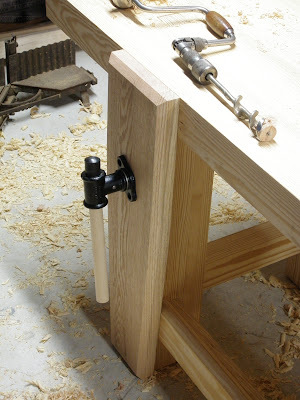 The leg vise is a slab secured by a large central screw to the front left leg of the bench. The screw acts as a fulcrum, while an adjustable parallel guide in the foot slides through a slot in the leg, jamming against it with a pin to exert leverage. You can crush stone with this thing. 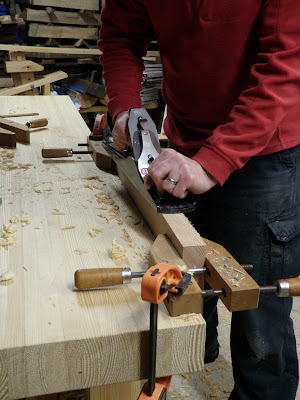 Planing the end grain for the top edge. I initially tried doing the end grain on my shooting board, but the thick slab of oak was difficult to work. Even using my largest plane for maximum mass, it kept jumping and chattering. I had read in The Joiner And Cabinet Maker about planing end grain, so I clamped it up and gave it a try, skewing the jointer a bit. What a difference! 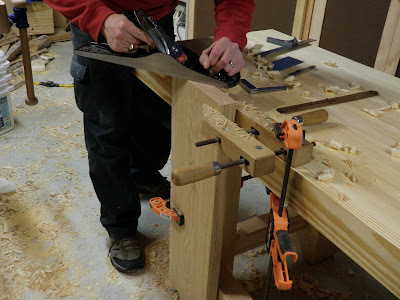 Since I was able to pitch my whole upper body mass behind it, the plane sang across taking full-length end-grain shavings as easy as planing pine edge grain. It was unbelievably smooth going. Ripping to width. 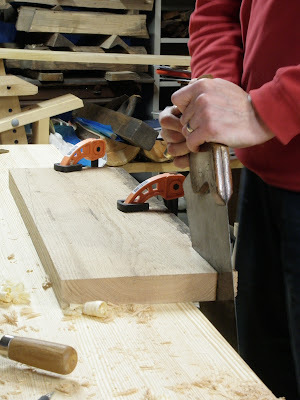 The leg vise is roughly coffin-shaped. 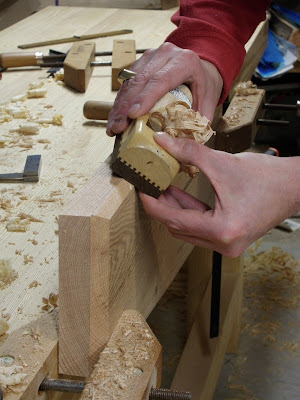 Jointing one of the tapered sides. 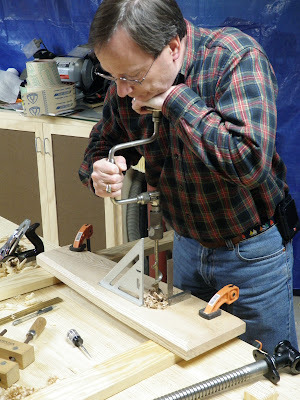 Chamfering the top edge with my wooden block plane. Chamfering the side. I love these large facets. First use of the planing stop! Smoothing the face. 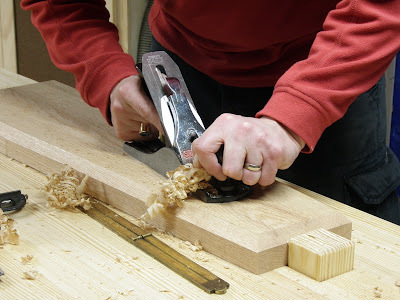 I realized too late I could have use the planing stop to do the chamfering. The urge to clamp the piece down solid to the bench before working it is overwhelming, but I have to learn to resist that. It's not always necessary, taking more setup time. Boring the hole for the screw with a large auger bit. Ok, so this is an operation that requires secure clamping. 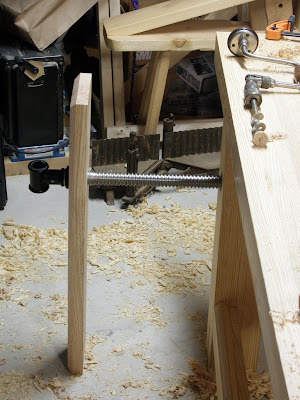 Test fitting the leg vise. With the screw end fully threaded, it still opens to a 12" span. That's a big vise! Closed up. Here you can see the ridiculously cheesy handle available for sale with the vise. I'll make a real handle to replace that. The next part of the vise will be the parallel guide at the bottom. This is great. Building a real workbench is one of those "someday" projects, but you're inspring me to go ahead and dive in. I've also started blogging from my (small) shop - please stop by! 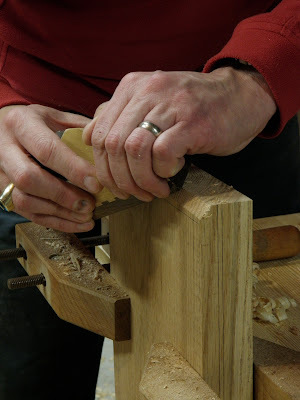 Man I would love to build a nice roubo someday. Can't wait to see the finished bench. Thanks! I actually finished it last night, so I have several pages to add to the blog. Awesome. I can't wait to see it. Here in Ecuador leg vises are very common,the screws cost $20. No one bothers with a parallel guide at the bottom, they just use an appropriately sized chunk of wood.